Though not exactly original, Fortune Hill is an attractive game with plenty to offer. Its theme is inspired by the Irish legends, with leprechauns, trolls, wizards and fairies being the main characters in it. 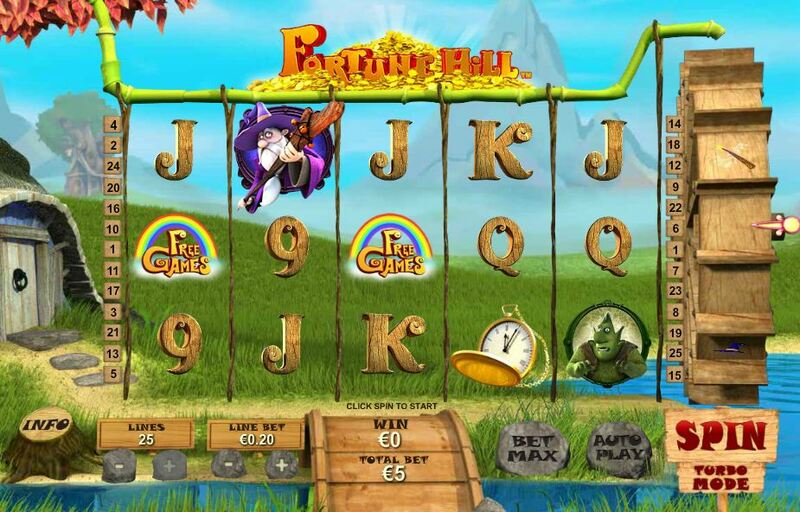 Designed by Playtech, Fortune Hill has a lot of competitors out there, so it’s not the best possible game with a theme of this kind that you can try out, but it does have one of the best designs. 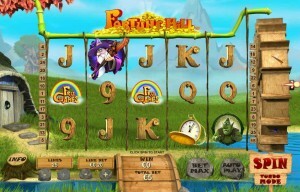 Like many other slots, this one also has 5 reels and up to 25 bet lines visible on them. 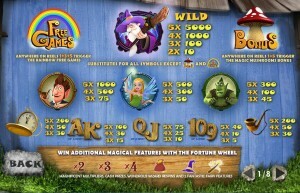 You can take home prizes of up to $250,000 and as features it will offer you free games, wilds, multipliers, bonus games and a very cool Fortune Wheel. 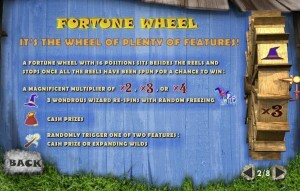 The Fortune Wheel is one feature you’re going to see activated quite often, along with expanding wilds, multipliers, re-spins with freezing wilds, free games, scatters, regular wilds and bonus games. The Wizard is the game’s wild feature. You will see it appear on all the reels of the game, either on its own or with other matching symbols on the same line. If it’s the latter, combinations will form and award you between 10 and 5,000x the line wager. If it’s the former, it will try and help you create a new combo with regular symbols, by substituting for one of them that is missing and useful in exactly the spot where the wild currently resides. Bonus and scatter symbols can’t be replaced with a wild. 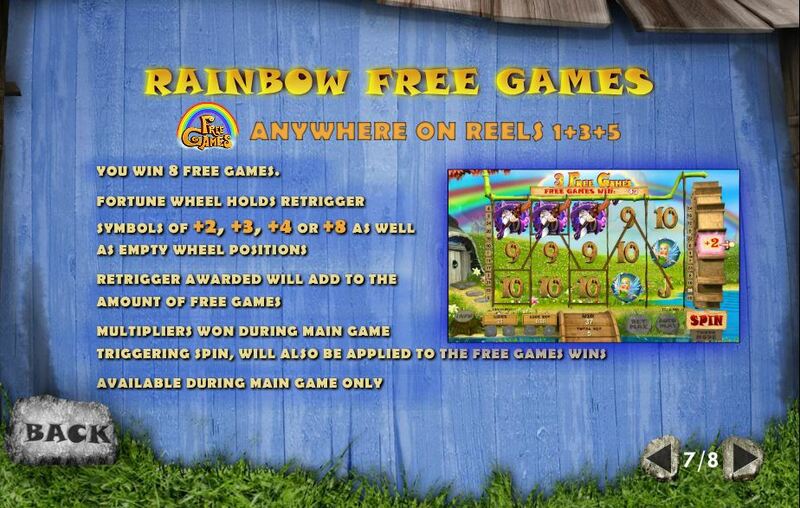 The Rainbow Free Games symbol is going to be the trigger for the slot’s free spins. The three reels which get this scatter are the 1st, 3rd and 5th. All three need the symbol on them, during the same spin. 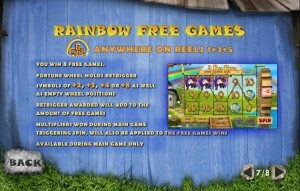 8 free games are won by players which get the required three scatters. 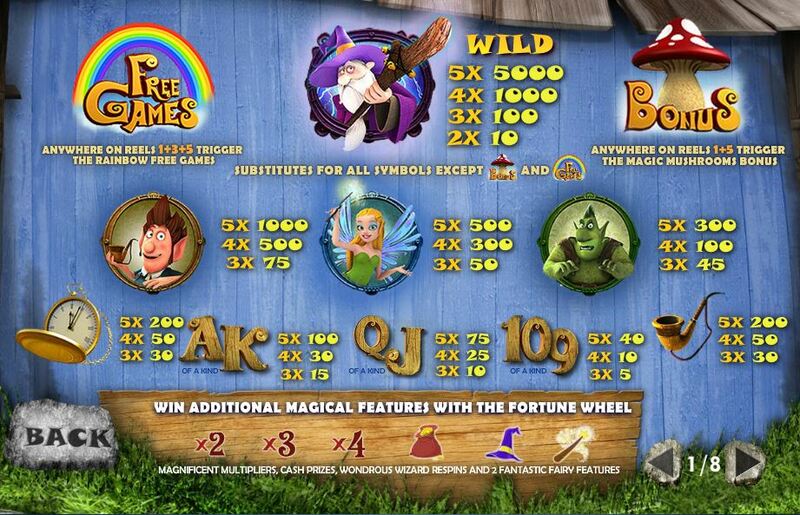 For the duration, the Fortune Wheel will give you empty or +2 to +8 positions (additional free games). 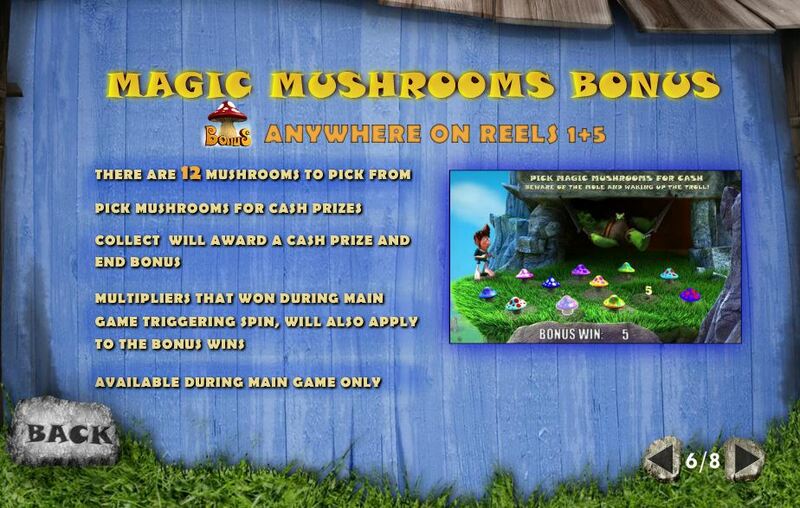 Another important part of the feature list is the bonus game, triggered whenever the Bonus Toadstool is on both the 1st and 5th reels at the same time. This is also a scatter, so the exact position on those reels doesn’t matter. The game will take you to a second screen, next to the troll’s cave. The leprechaun has to choose from among the 12 mushrooms which are growing there. 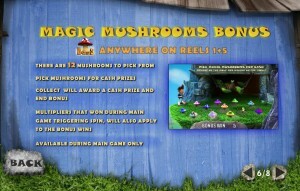 You can keep choosing mushrooms and getting paid for as long as you don’t get the Collect message. This is a feature that is connected to the water wheel you see on the right side of the reels. It will randomly display additional magical features which can be triggered by it. 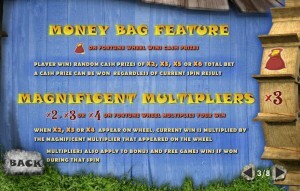 You might get a multiplier of 2, 3 or 4x, or you can get things like re-spins with freezing wilds, cash prizes or expanding wilds. This is one of the features which needs to be triggered by the Fortune Wheel. On it, you need a Money bag symbol to be in the right position in order for the feature to start. The cash prize offered here will be worth between 2x and 6x the triggering bet. 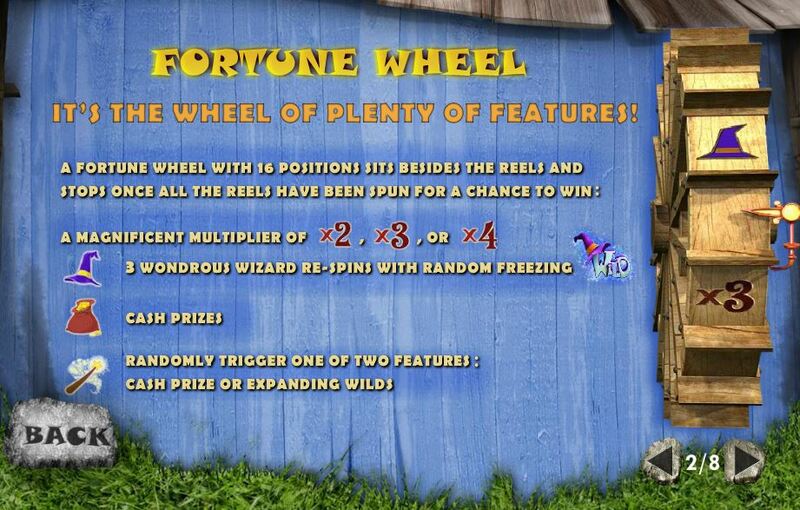 If you happen to get the Wizard Hat symbol on the Fortune Wheel, the result will be the start of a round with 3 re-spins and with randomly chosen frozen wilds. 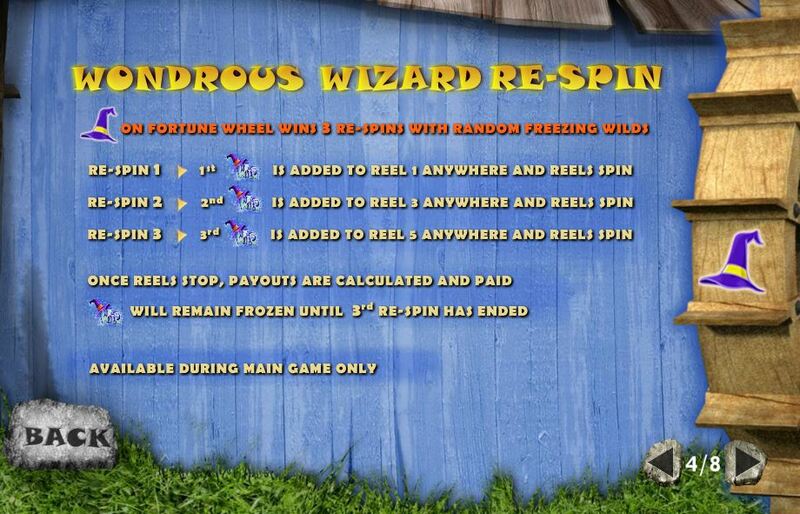 The first frozen wild is added to the 1st reel, in the first re-spin. The second wild comes to the 3rd reel, during the second re-spin. 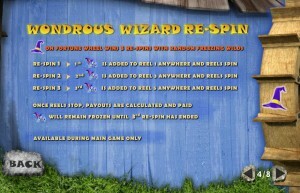 The 5th reel gets the third frozen wild, during the last re-spin. 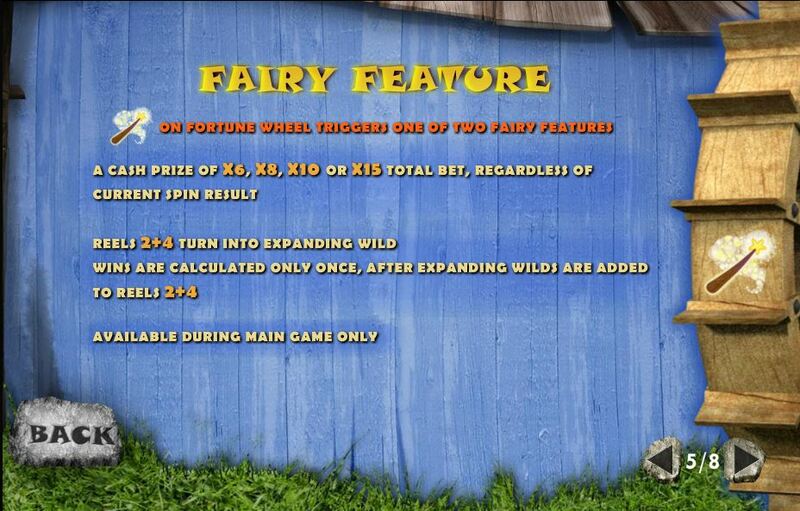 The Magic Wand, when it appears on the Fortune Wheel, will trigger for you either a cash prize or expanding wilds. The cash prize can be worth 6x, 8x, 10x or 15x the triggering bet. As for the expanding wild, it appears on the 2nd and the 4th reels, hopefully giving you a much better payout for that particular spin of the reels. The game’s betting takes place on the 25 lines available, with the exact number being a decision that the player can make. Each line gets only one coin, but with a big denomination range, of $0.01 to $50. Bets of up to $1,250 are possible for each round. Regular payouts will offer you up to 5,000 coins, which should mean $250,000 cash or less. 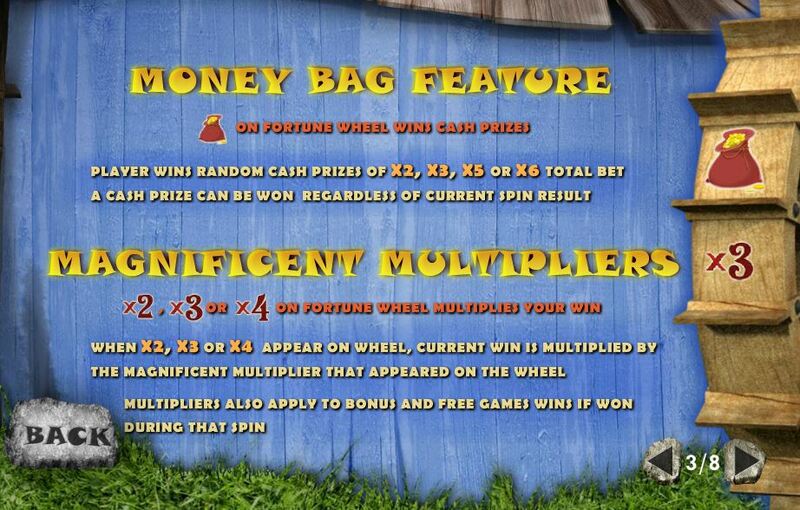 There is also a multiplier of up to 4x which is applied by the Fortune Wheel though, so in theory you can even get into million dollar territory. The game’s theme might be inspired by Irish legends and leprechauns, but the story seems somewhat different. First of all, the story you get from the intro is about a group of three friends (leprechaun, fairy and wizard), which lost their magic mushrooms to a troll that takes them to his cave. The leprechaun takes them back, with the intro ending as he’s running from the troll. You see the leprechaun’s hobbit like home on the left side, green grassy hills in the middle and a water wheel on the right. The reels are placed in the middle, completely transparent and being separated by vines which hang from a tube. Symbols: Rainbow (scatter), Toadstool (scatter), Wizard (5,000 coins, wild), Leprechaun (1,000 coins), Fairy (500 coins), Troll (300 coins), Pocket Watch (200 coins), Smoking Pipe (200 coins), Ace (100 coins), King (100 coins), Queen (75 coins), Jack (75 coins), 10 (40 coins) and 9 (40 coins). I wouldn’t usually recommend games which give you themes that are so common, but Fortune Hill actually has a bit of a story behind it and some very interesting features and top prizes. You will find Fortune Hill at any online casino which chooses to use software from Playtech, playable either for free or for real money.